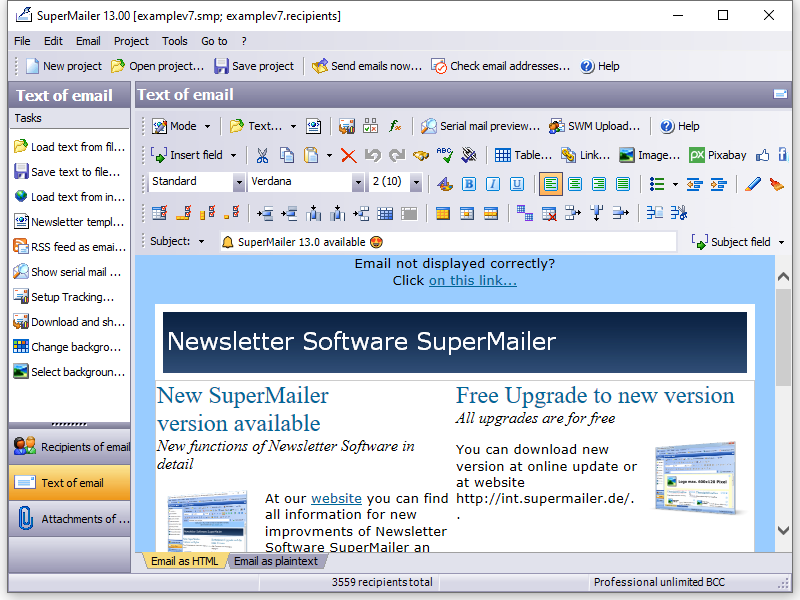 Email newsletter software SuperMailer lets you create and send mass mails easy like never before. With this newsletter software you can create newsletters as plaintext or HTML (WYSIWYG editor integrated), import recipients quickly and send emails very fast. 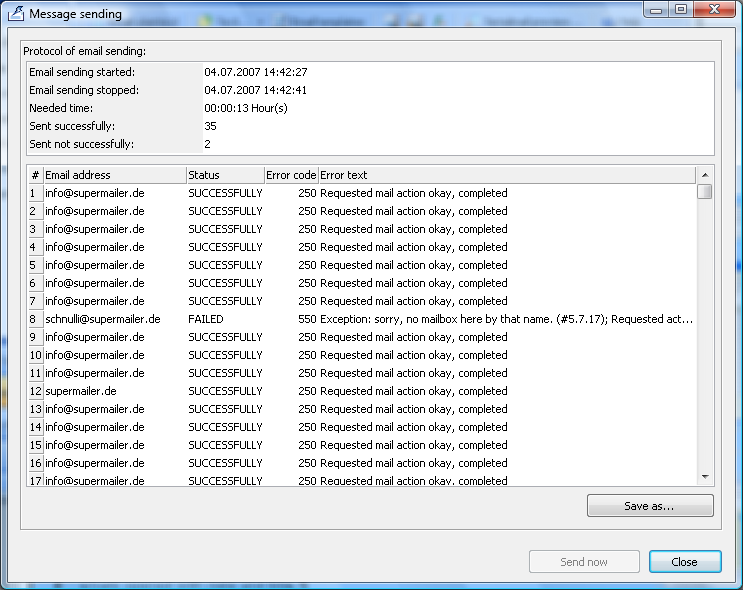 SuperMailer sends separately an email to every recipient, so that the recipient can't see the email addresses from other recipients. To load a freeware version, please go to the download area. 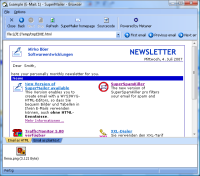 You can use email marketing software SuperMailer under Windows 2000, XP, Vista, Windows 7, 8 or Windows 10. To send your newsletters you can use simply the SMTP service of your email provider or Microsoft Outlook (version 2000 or higher) and any other MAPI capable application like Outlook Express, Windows Mail and Lotus Notes. 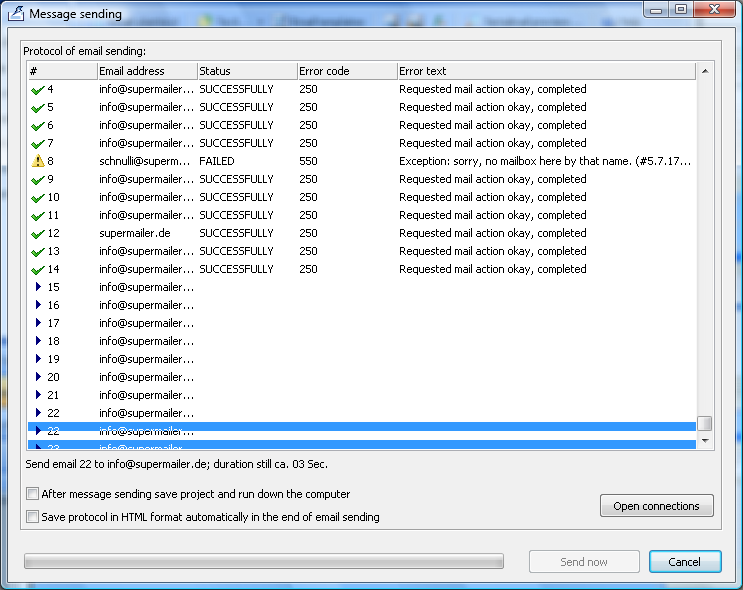 SuperMailer can also send the emails with a mail send script (PHP4/5/7 required). The PHP script will run on your own web space or dedicated server and will send the newsletters. sending 1400 newsletters with a size of 16kbyte on 512 kbs upload speed and 25* threads running for the process. *SuperMailer allows only 10 threads on default. If you can prove that you use your own server or your web space provider allows you using more threads, we tell you a special command line parameter to configure more threads. More threads are only usefully on upload speeds over 384 Kbit/s. sending 100 personalized emails with a 1 Mbyte attachment and a embedded picture (size of email 1,4 Mb, total data size 140 Mbyte) with the PHP mail send script on the own web space/server. 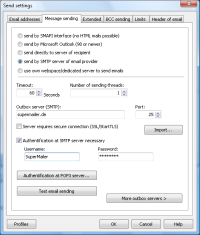 By sending the same emails with a SMTP server the sending process will take 22 minutes (Upload speed 1024 Kbit/s). 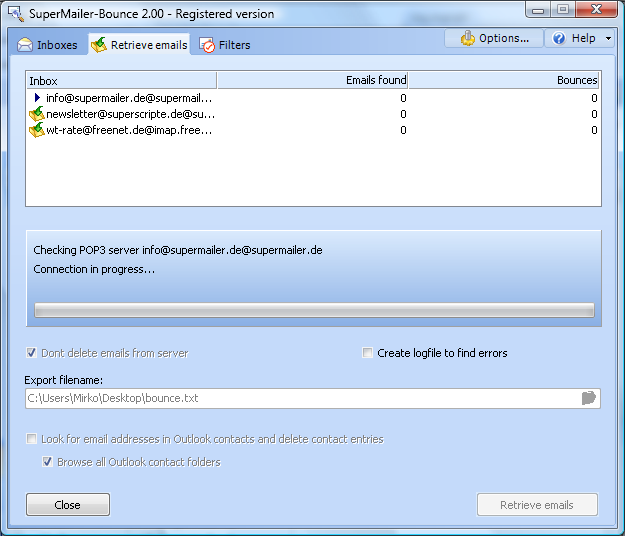 with SuperMailer-Bounce you can load bounced email addresses from file. You can add, edit or delete recipients manually. SuperMailer uses the structure from text files automatically, databases etc., so that's there no need to create fields manually. You can create how many fields you need. With help of a small script, you can provide subscriptions and unsubscriptions of your newsletter directly from your own website or via a special unsubscribe link in your newsletter. This script supports the double opt in procedure (permission based marketing). 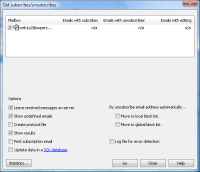 SuperMailer receives this subscriptions/unsubscriptions from your POP3, IMAP inbox or from an Outlook mail folder and will add or remove the recipients automatically. 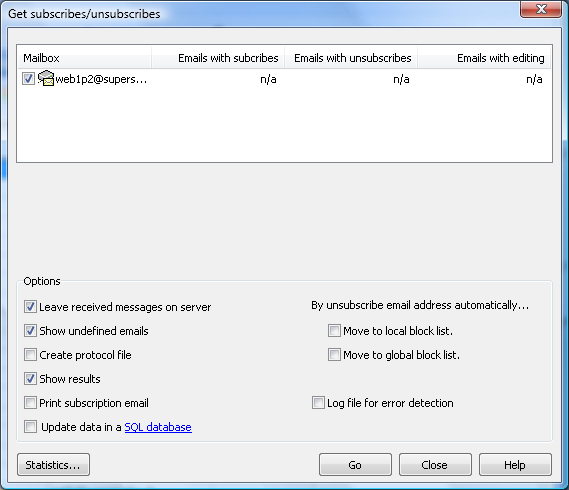 You can also let SuperMailer write the subscriptions/unsubscriptions to a SQL database directly. personalized serial emails by placing fieldnames in it. 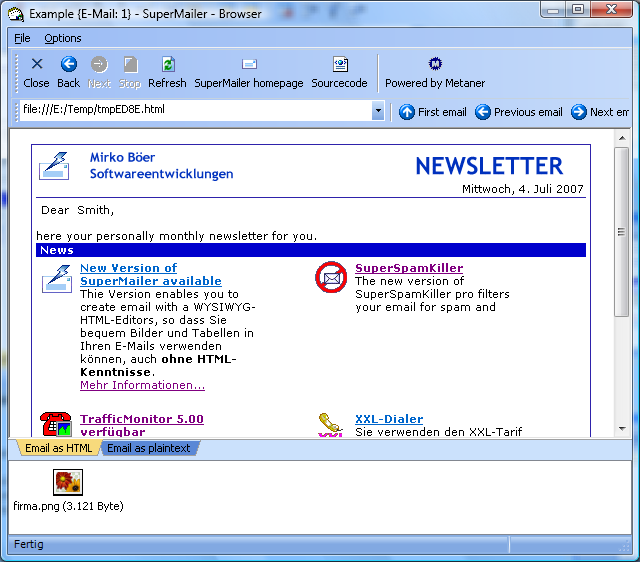 SuperMailer fills this placeholders automatically with the correct information of the actual recipient before sending the email. You can use the integrated WYSIWYG editor to create HTML emails. Place images, tables, horizontal rules, background images or other HTML elements on your email easily. You can see it directly on screen. Pictures and sounds are send to the recipient of your emails automatically. So uploads to your web space are not needed. 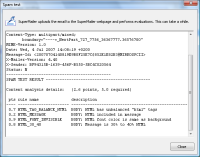 By using HTML, SuperMailer generates "multipart" emails automatically. This means email clients not be able to show HTML emails uses the plaintext part. 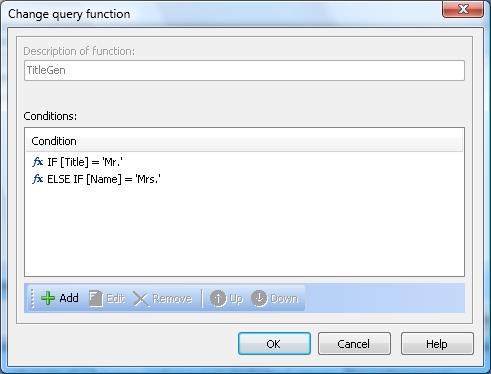 This plaintext part you can let create from the HTML part or write separately. If you only whish HTML or plaintext, you can do this this way with only a few mouse clicks. Use a HTML template and import RSS feed entries e.g. RSS feed from your Blog and send it as newsletter to all newsletter recipients (RSS2Email). Use the link checker to check hyperlinks in the document for correctness. With the alternative browser link you can provide your recipients the possibility to read the newsletter in the default browser so you can solve problems with not shown pictures or special layouts (Webspace with PHP4/5/7 script support required). will show you how your newsletter will be shown in the recipients email program. You can have a preview for every email with included recipients data. will show all embedded images and attachments. 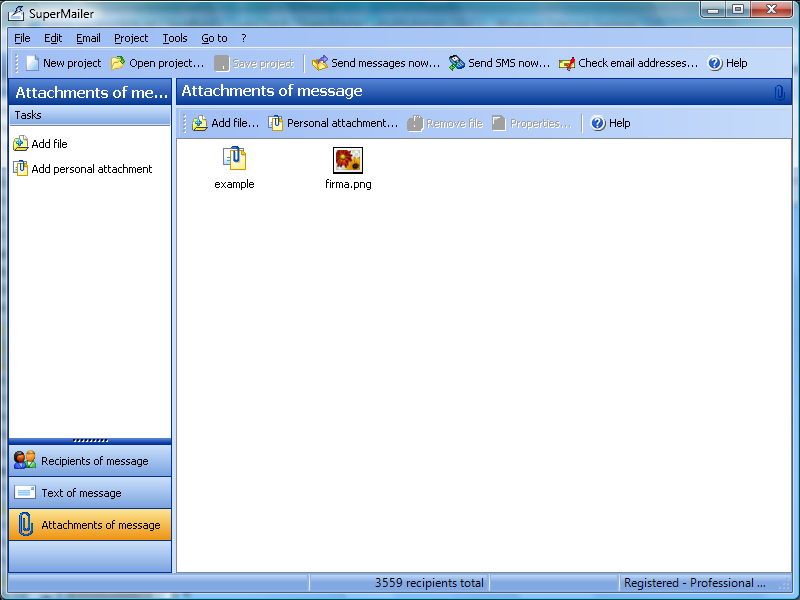 SuperMailer can create personalized attachments. You can use a Word or Excel template file and let SuperMailer replace all placeholders e.g. name and first name in this file. 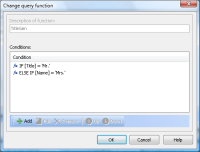 Optionally you can create a PDF file from the Word or Excel file. 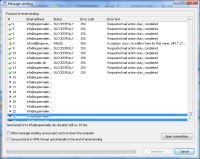 For PDF file creation you must install Ghostscript and Redmon. 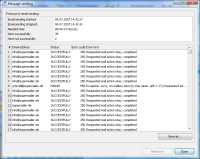 all messages over the outbox server (SMTP server) of your provider and that with up to 10 threads (connections) at the same time. This transfers your messages very fast. 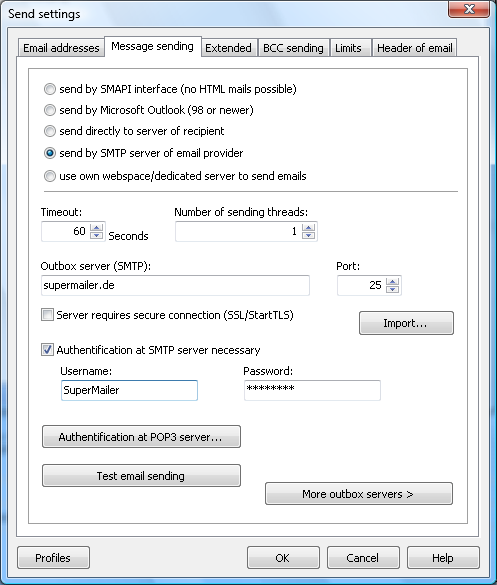 Naturally SuperMailer supports SMTP authentication and POP3 before SMTP authentication. You can also specify more than on outbox server for email sending. 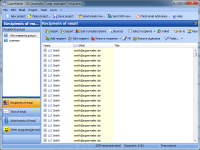 all newsletters directly to the recipients server acting as a SMTP server, so that problems with email providers, restricted number of sent emails etc. can be handled. This method is only recommend for internet connections with a static IP address. all emails with help of your own webspace or dedicated server. The webspace or dedicated server must support PHP4/5 or PHP7 scripts. 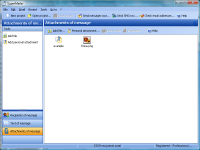 Alternatively you can send via Microsoft Outlook/Microsoft Outlook with Exchange server (HTML, plaintext and embedded images) or any other MAPI capable application like Outlook Express or Lotus Notes (only plaintext). While sending the emails you can see the progress and possible errors live on your screen. 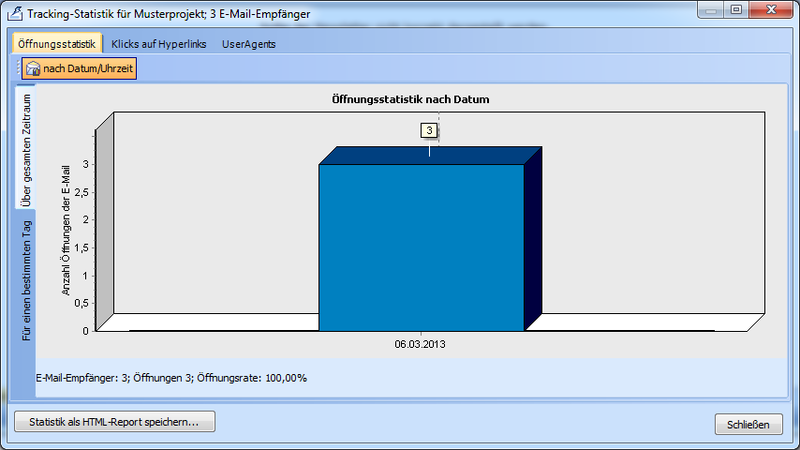 You can also see the estimated remaining time for sending your newsletters / serial mails. After sending process is completed you can check the protocol and save it as plaintext or HTML file. Hint: Unsuccessful transmissions can be filtered and resend with a click on button "Select failings" under "Recipients of message". 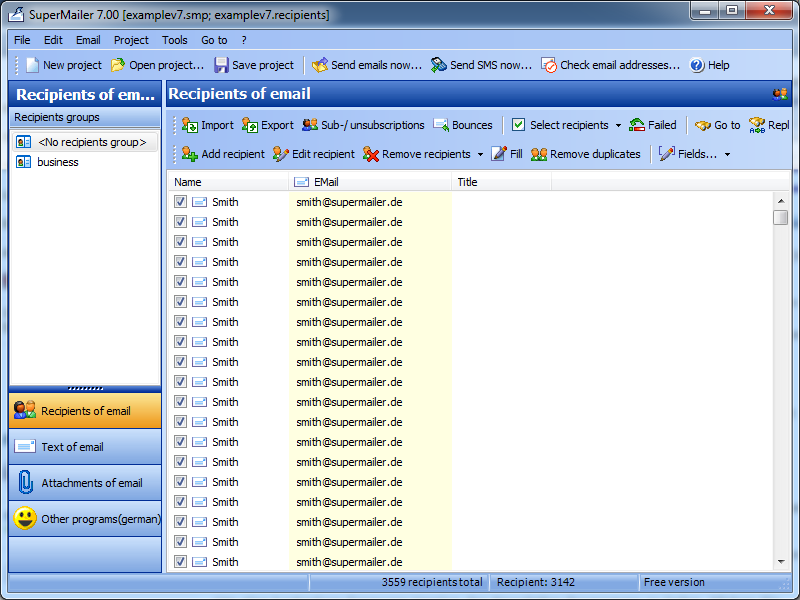 SuperMailer tries to send this emails again to this selected recipients. Was the mailing campaign a success? The tracking function are only available for HTML newsletters. emails opened with date and time. 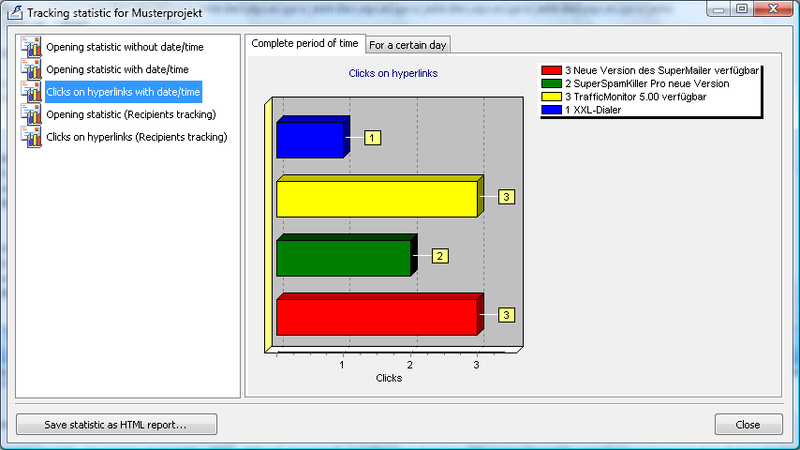 hyperlinks clicked with date and time. Personalized Tracking You can see which customer has opened the email or has clicked on links in your newsletter. To use this function you have the permission of each newsletter recipient. To use the tracking function your webspace provider or own dedicated server must support PHP4/5 or 7 scripts and MySQL. With the integrated email address checking function you can check your email addresses with up to 100 threads simultaneous and let delete automatically wrong addresses from your list. 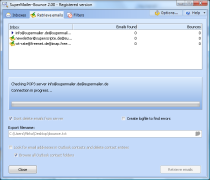 SuperMailer-Bounce can retrieve bounced emails from POP3/IMAP inboxes or from a Microsoft Outlook mail folder and removes email addresses from recipients list. 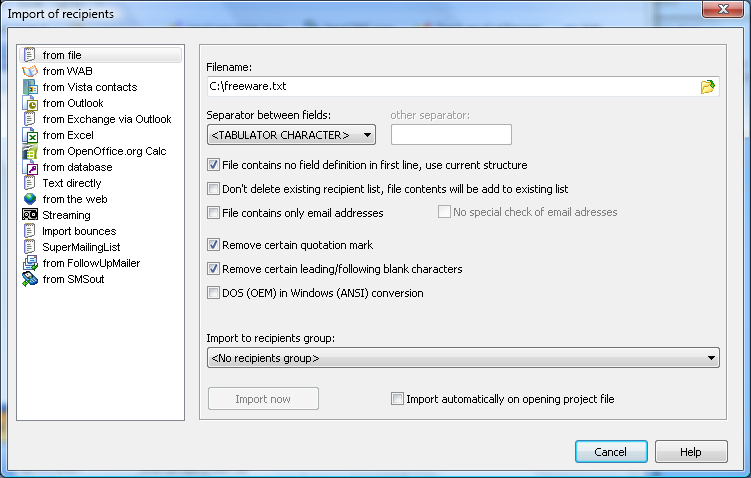 Optionally it can write the email addresses in a text file or removes it from Microsoft Outlook contacts folder. With a configuration file (example enclosed and described in help file) you can automate SuperMailer. With this file you can select the source of your recipient list, the look of your emails, file attachments, sending options etc. to send via SuperMailer automatically. This feature is useful if you provide a own software like a customer or address manager. You want to download a freeware version? In download area you can download a freeware version. With this version you can send newsletters to up to 100 recipients. If you like SuperMailer, you can order a license.